Home / HOME / SINGLES / VIDEOS / Chox-Mak (@Chox_Mak910) f. DJ YRS Jerzy (@IAMDJYRSJERZY) & Jus Daze (@JusDaze) - " Yourself "
Chox-Mak (@Chox_Mak910) f. DJ YRS Jerzy (@IAMDJYRSJERZY) & Jus Daze (@JusDaze) - " Yourself "
Chox-Mak and DJ YRS Jerzy show everyone that they are not playing games and they are very serious about their craft. This time they connect with Jus Daze a rising recording artist out of Queens, New York. 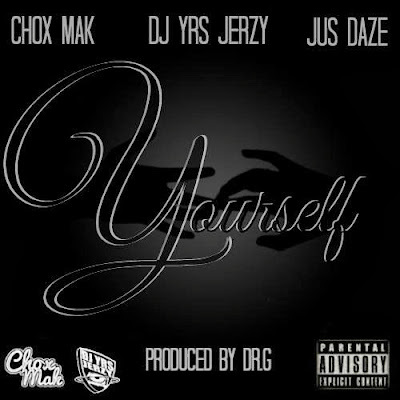 This new track titled "Yourself" is a track that gives you a visual through the lyrics giving you real life struggles that these artists are going through. Many people will relate to this track on a personal level if you ever had any tough times in life that you ever had to go through. The Production was brought to you by DR.G out of the UK.